Donuts are the one thing cops and skaters may always agree on. 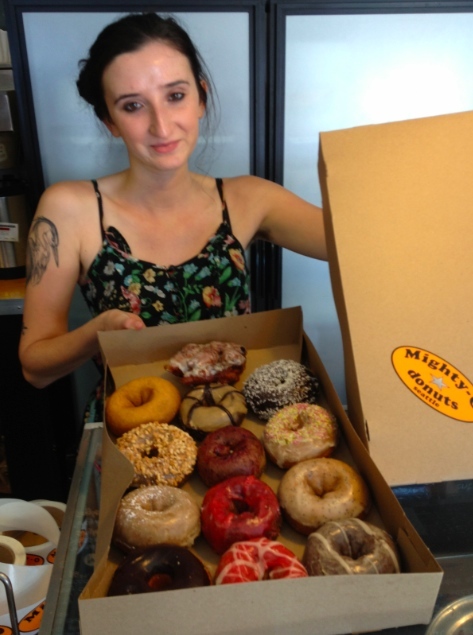 With that Mighty-O Donuts are easily the ultimate skate snack! 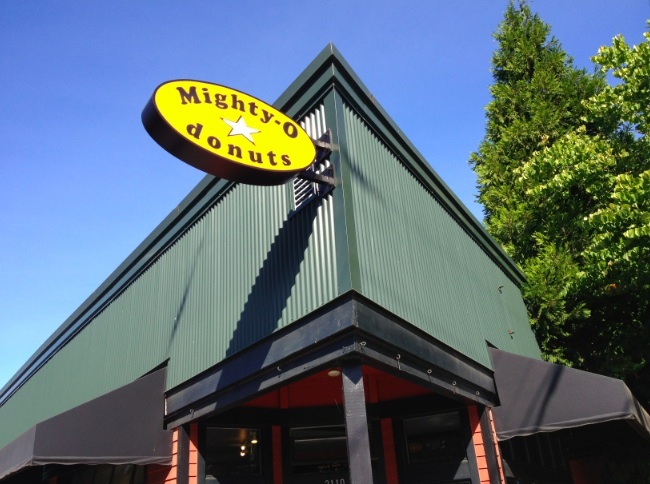 Mighty-O has been frying up donuts in their shop since 2003 and they are beyond delicious. They are also fully organic (if thats your thing) and the ingredients are ethically sourced. For example, the Red Palm oil they use for frying comes from an environmentally responsible producer in Brazil. As apposed to the slash and burn Indonesian Palm Oil so commonly used in commercial baked goods. Just look at that massive selection. Iced ringed goodness galore everyone of them more delectable then the next. So what else are you going to do in a situation like this? 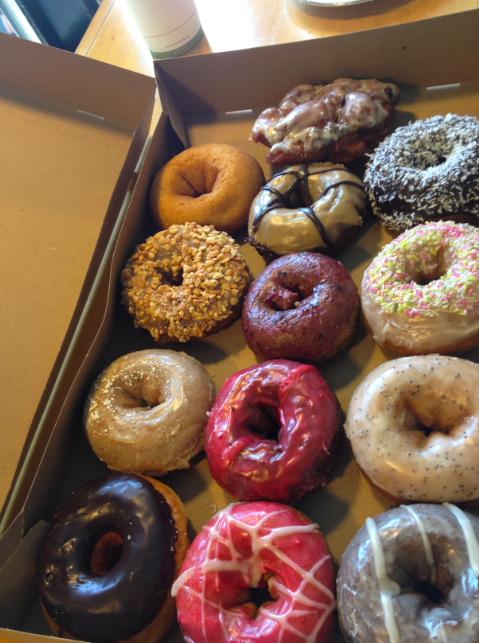 Go Homer Simpsons style and buy a Bakers Dozen. 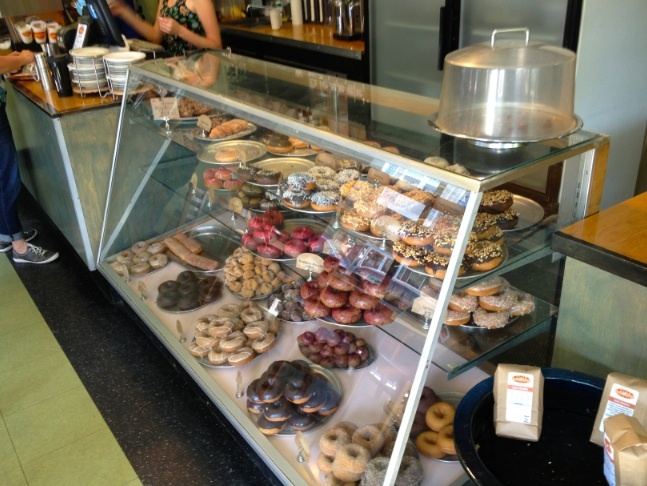 Thats right, 12 donuts and a peach fritter. After all these are skate snacks, and skate boarding burns precious calories. If you wonder how these magical cakes come about, wonder no more. The Belshaw Mark V is responsible for those drool inducing racks in the background. No skateparks super close, but it is pretty close off the highway. So no problem picking up a few dozen when traveling to and from skate sessions or heading out of town, after all Portland is like 3 hours away. stickler: how does survival international feel about the palm oil provider? 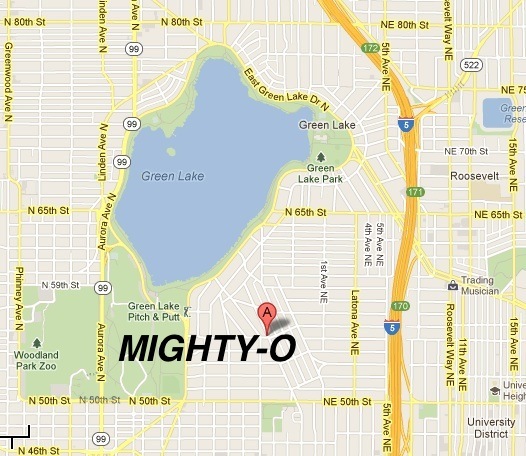 I sent an email to mighty o for particular documentation, and will get back as soon as I hear back. 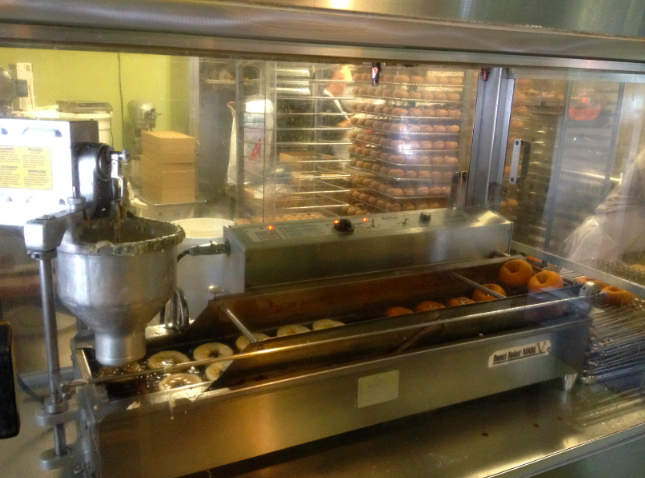 So a quick response back from Mighty-O Donuts, here is the email. I’m so glad you contacted us about our palm oil to answer one of your follower’s questions. We are committed to ensuring that all our ingredients come from companies with sustainable practices, organic production standards and the fair treatment of farmers and employees. Our organic palm oil is sourced from Agropalma, a company which started more than 10 years ago in an agricultural area of the Amazon delta near Belem in Brazil. Since then, Agropalma has reforested 185,000 acres of previously cultivated land, which consequentially led to the rehabilitation of 7 previously endangered animal species. Agropalma has a policy of never replacing forest with plantations. The Agropalma project has also been approved as one of the first EcoSocial projects in Brazil. All the organic production is certified by the USDA. Feel free to contact us if you or your readers have any other questions. I looked over the links to see if it addresses the issue of Aboriginal Rights and couldn’t find anything. Certainly a good thing to research and always know more about our food and possible impacts. Rad place awesome donuts. 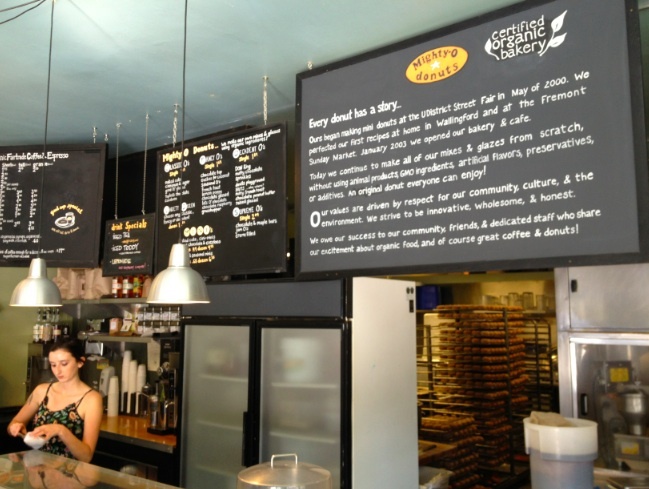 The only thing that confused me was a vegan donut place that serves cows milk. This place looks amazing. I wish I would have had a chance to make it out there when I was in Seattle but I ran out of time. Great follow up on the palm oil.